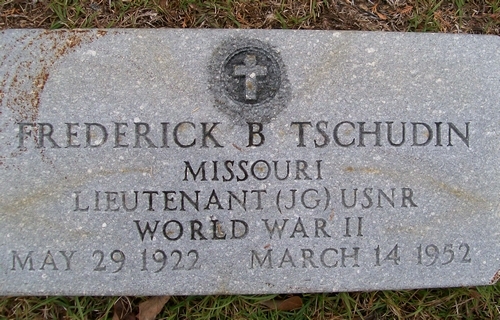 Frederick Beverly Tschudin, son of Mr. and Mrs. Emil Tschudin, was born on May 29, 1922, in St. Louis, Missouri. He attended Beaumont High School in St. Louis, and signed as a catcher with the St. Louis Browns in 1940. Assigned to the Lafayette White Sox of the Class D Evangeline League, Tschudin (who used the first names of Fred and Beverly during his playing career) batted .200 in 70 games. In 1941 he started the season with Lafayette but was released at the end of June and picked up by the Port Arthur Tarpons of the same league. By mid-July he was with the Evangeline League’s Rayne Rice Birds and finished the year with the Alexandria Aces. In 55 games he batted .192. Tschudin started the 1942 campaign with Alexandria but joined the Pampa Oilers of the Class D West Texas-New Mexico League in June. Playing just 10 games with the Oilers, Tschudin joined the Muskogee Reds of the Class C Western Association for the remainder of the season, batting .212 in 62 games and earning honorable mention as a Western Association all-star selection. Tschudin’s contract was owned by the Shreveport Sports of the Texas League at this time, but when the Sports ceased operations at the end of 1942, the 20-year-old catcher was purchased by the St. Paul Saints of the American Association. However, he never played a game for his new affiliate before military service beckoned early in 1943. Tschudin served with the US Navy during World War II and attained the rank of Lieutenant serving with VT-17 (Torpedo Squadron 17) aboard the USS Hornet. Returning to baseball in 1946, Tschudin attended spring training with St. Paul and started the regular season with the Asheville Tourists of the Class B Tri-State League. He batted .206 in 50 games before joining the Grand Forks Chiefs of the Class C Northern League. Tschudin really found his stride with the Chiefs and hit .327 in 30 games. He was with the Pensacola Fliers and the Vicksburg Billies of the Class B Southeastern League in 1947 and joined the Miami Tourists of the Class C Florida International League in 1948, batting .273 in 135 games. In 1949, Miami became a Brooklyn Dodgers affiliate and Tschudin spent spring training with the renamed Sun Sox at recently opened Dodgertown. By the time the regular season came around, Tschudin was with the Douglas Trojans of the Class D Georgia State League where he enjoyed a career year batting .350 in 135 games. Aged 28, he was named player-manager of the Trojans during 1950 and led the club to a second-place finish. He was player-manager of the Tifton Blue Sox in 1951 and batted .300 in 122 games while guiding the team to a fourth place finish and a spot in the league finals. By the time spring training 1952 came around the Korean War was almost two years old. Many players were in military service and Tschudin – with his WWII combat aviation experience – was serving as a civilian instructor at Kinston Air Base in Georgia, a USAF Air Training Command base. On March 14, 1952, Second Lieutenant Martin F. Gould – a Rutgers graduate – was taking flight training instruction from Tschudin aboard a North American T-6D Texan. At some point during the flight the single-engined trainer suffered engine failure and crashed while attempting an emergency landing 12 miles northwest of Kinston, killing both Tschudin and Gould. Fred Tschudin was survived by his widow Winifred “Winkie” Mitchell (Winkie passed away in 2004) and their two children John Richard and Cindy. He is buried at Douglas City Cemetery in Douglas, Georgia.